Home / Asia / Travel and Living / Brunei in a day! My shortest international trip! November 2017 I booked a return ticket to Brunei- cost me INR 7800 for the round trip ticket. Travel date was for January 2019 and I had done this booking after tracking AirAsia fares to Brunei over an year and convincing myself that it is unlikely to get any cheaper. Under normal conditions, you will only get one way ticket to Kuala Lumpur for that price. But at that time I had no idea how things will pan out- I took a chance and booked. Mid 2018 I started worrying about the trip to Brunei- figured that Visa is required, not that difficult and would cost about 4k, half of my ticket cost. Started researching about Brunei, realized that there may not be an easy to use and affordable public transportation and we may have to spend lots of money on taxi and tours. Some top popular destinations cost USD 125 per person for a day tour- more than my return ticket price. December 2018 I paid and processed Brunei visa through an agency. Got my passport back in January first week. Visa cost me some Rs 2700, not 4000 as I was told earlier. While I could travel on 7 out of 8 international trips in 2018, 2019 was a different thing. I had exhausted all my leaves. WOW Air cancelling India flight meant two of my trips were washed out. Didn’t have any more trips planned other than the Brunei trip. Wasn’t sure how it will pan out either. After about 1 year of ticket booking, Mid December 2018, just a few days after I had initiated visa process, AirAsia announced cancellation of one of the flights on which we were supposed to fly- morning flight from Brunei to KUL was cancelled for the day of my travel. This was a blessing in disguise, as it gives me an entitlement to reschedule the flights, which otherwise are not possible at all on a promo fare. January second week it appeared that I may not be traveling at all- Not having leave balance and other work related reasons meant I won't be having the luxury of time. The 5 day original plan which counted on getting 3 days of leave was no longer an option. I had to decide between cancelling the trip n taking back my money vs convert the trip into short weekend trip. Republic day falling on a Saturday wasn't helping either. I don’t have any other plans for 2019, losing this will further worsen the situation. With very limited leaves left and leave availability being scarce, even if I had a few more days in future should I spend that on Brunei or go somewhere else? Then an idea came up- why not visit Brunei just for the weekend (I don’t need leave for the weekend). But it was a tough one. I could leave Chennai on Friday night and return to Chennai on Sunday night, but I would lose lots of time in transit and only get about 21-22 hours in Brunei. Due to unfavorable flight timings I would lose half a day in Kuala Lumpur. Too little but something is better than nothing. After lots of deliberation I went for it- I could visit one more country, Brunei as such doesn’t have so many things to see- I could see most important mosques and return next day, this will be some salvage of the trip compared to a total wipe out. I would have to spend a bit more on hotel and food but it would be worth it. I could get the ticket rescheduled for free. Leave on Friday night, return on Sunday night, spend a day at Brunei. Not visiting Brunei will keep haunting, will be tempted to keep checking for better deals to revisit in future. Can tick Brunei off the bucket list n focus on other destinations. Can spend future leaves more wisely-if I had a chance to spend 3-4 days why not go to somewhere new like Cambodia, Laos etc? 10-12k (ticket)+ 2.7 visa+ 10-12k for 3-4 night stay, food and other expenses= 25-26k normal, 20k if I manage to get ticket again at 7.8k + cost of leaves, cost of wasted visa.. really worth? Thus the trip finally happened. I arrived at 4.30 PM, explored as much as I could till next day 2 PM and went back to airport! Just about 21 hours in the country- my shortest trip ever to any country. Brunei is popular for its mosques and additional attractions include forest reserves, museums etc. Of course 1 day is bit too tight and too little- 3-4 days is ideal time to explore most important places in Brunei- but considering the cost of planning a separate trip, I am glad I set foot in the country even if it is for a day. It was too much travel & logistics just for a day- may be I was wrong- but it is me. 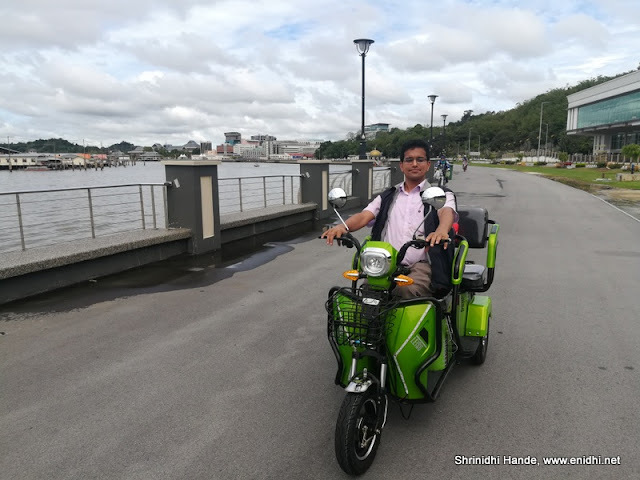 The 24 hour window was enough to visit the popular Omar Ali Saifuddien Mosque in Brunei, water village, Tasek Lama recreational Park, enjoy a ride on an electric scooter on the banks of the river, visit few shopping malls, get a good understanding of Brunei's public transport system and more. Of course I didn't have the time to meet Sultan of Brunei and check out his collection of cars! I will probably consider revisiting Brunei one more time, after exhausting all interesting destinations on Air Aisa network and if I manage to get a super low fare ticket again. Prior to this, my shortest trip was to Srilanka, back in 2011, my first international trip. It was inspired by a Rs 4008 return ticket on Spicejet- we left Friday night, arrived by 1 AM, made the driver drive all the way to Kandy- reached there by day time, explored Kandy, Nuwara Eliya and came back to Negomobo, next day explored Colombo and back to airport by Sunday night and back in Chennai Monday morning in time to go to office.- About 48 hours and total expense of Rs 10000 per person everything included. Those low fares are history now! Brunei is on my list too but when, I have no idea. Such a short trip but you were able to show us the details of the journey. I am sure you are going to remember this trip for a long time. Nice. Actually I like this weekend trips with 0 expectations. Was that a bike taxi you were on? My goodness that is amazing! Great , Beautiful pics from Brunei. What fun to read! Great work, Srinidhi. Very interesting. 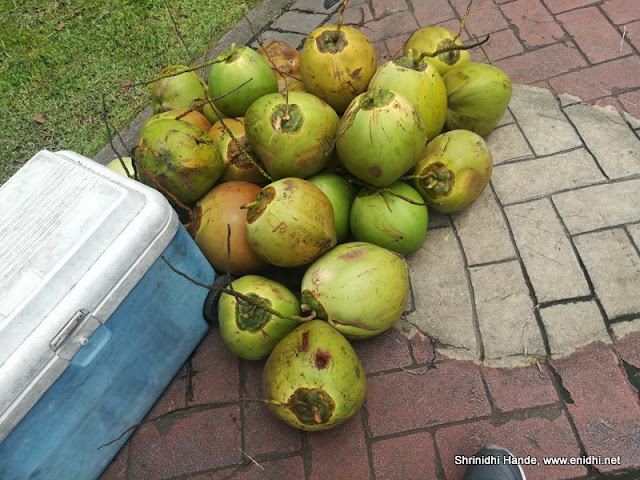 But those coconuts would have made you say- Worth it!